Wayne Drosynski is the Brunswick champion of Slam Poetry and will bring together slam poets and audience on April 18 at Beans in the Belfry. This is what Wayne has to say – yes So Say It! might deteriorate into a “poetry reading. A huge thank you to our Mistress of Ceremonies, Caroline Goell! Vote for your 3 favorite poems in order of preference. Vote using the Letters A-M shown with the poems above. second box and the letter of your third favorite in the last box. Please do not put the same letter in more than one box. Jazz and Bluegrass are very different types of music, especially when considering the typical sound each of the music styles has. 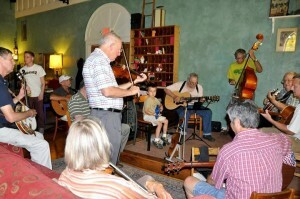 But, despite all of the differences, bluegrass and jazz have special similarities. They are both uniquely American, shaped by European immigrants and African American roots. 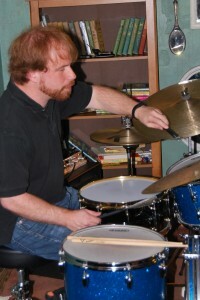 During the course of a piece of music, each instrument will take its turn playing the melody and improvising around it, while the others perform accompaniment; these ‘Breakdowns’ are often characterized by rapid tempos and unusual instrumental dexterity and sometimes by complex chord changes. 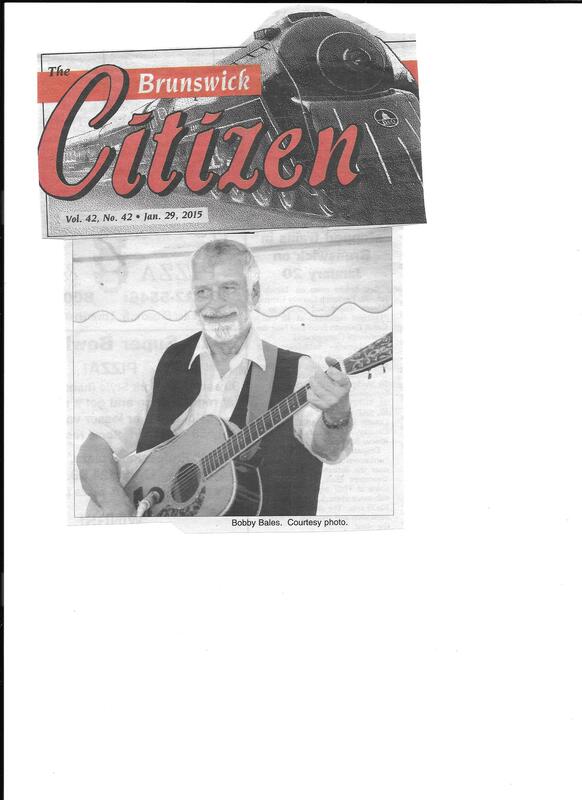 Jazz and bluegrass are also very explorative and both styles are easily participatory. 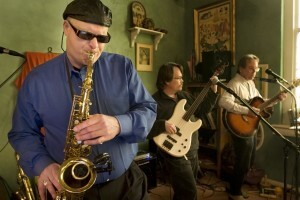 A good working knowledge of several dozen ‘classic’ tunes (jazzmando.com) will enable you to play practically any song. At Beans in the Belfry you can listen to bluegrass regularly at least four times a month, most Thursday evenings, second and fifth Sunday afternoon, and some weekend evenings when many groups have a bluegrass / Americana theme. 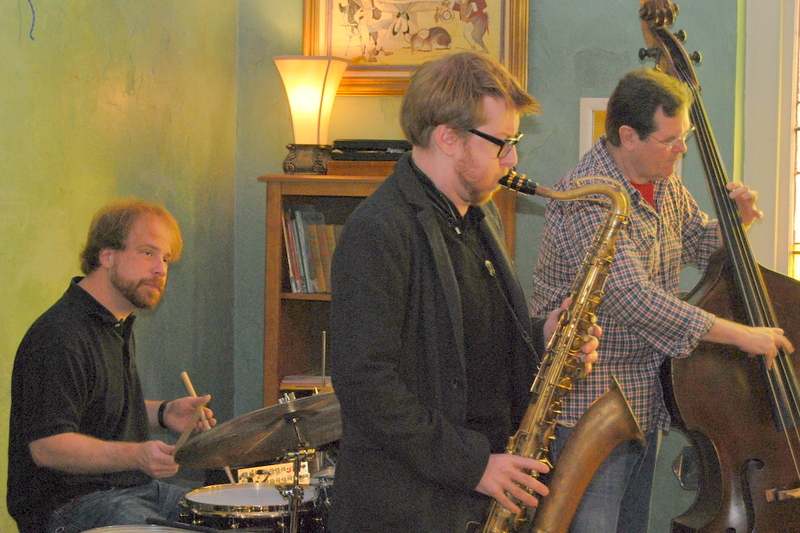 You can hear jazz every Sunday during brunch and second Wednesday evenings. 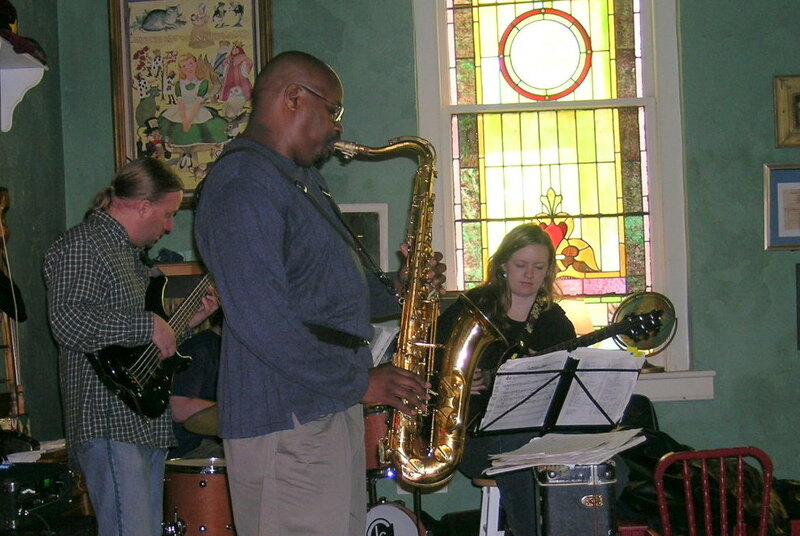 On Sundays the groups can be a duo or trio of guitar, vocals, clarinet, flute, saxophone, keyboard, drums, trumpet and even tuba. 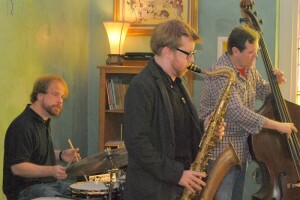 Themes vary from New Orleans style, to bebop, fusion, dixiland and modern jazz. 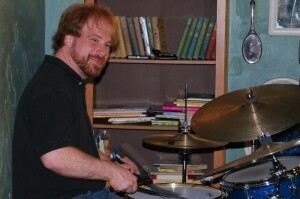 Jazz drummer Jeff Cosgrove will be performing at Beans in the Belfry on Wednesday, February 11, from 7 to 9pm. He will be back to play every second Wednesday. 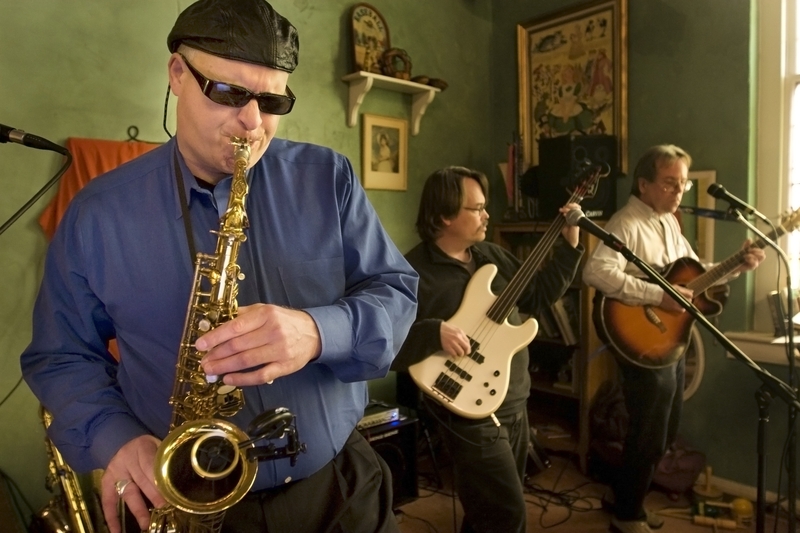 Launching his “mixed bag” of world class jazz, Jeff is an internationally known musician who has been written about in jazz publications all over the world; Tokyo, Italy, France and Belgium to name a few. He has also been recognized by The Washington Post, and the New York Times. As an artist, Jeff understands the importance of being proactive and promoting himself. To be recognized in international magazines, Jeff wrote his own press releases and had them translated into Japanese, French, Italian and other languages. Jeff grew up in the Washington DC area, attending high school in Alexandria, VA. Wanting to play music, he tried the clarinet in the 4th grade but “failed” so turned his attention to the saxophone. This wasn’t a success either. “I wasn’t big enough!” he says. He does not come from a musical family, but his grandfather loved music and encouraged young Jeff to play. “He was my mentor”, he recalls. Eager to play some sort of musical instrument, Jeff got behind a drum set in the sixth grade and was hooked. He began playing in garage and touring bands but says over the last 30 years he has only been in about five bands. Through the years, Jeff has studied with master drummers Mike Shepherd, Tony Martucci, Joe Hunt, Matt Wilson and Andrew Cyrille. 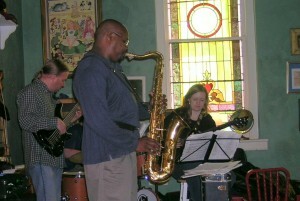 As an adult, he moved to Shepherdstown, WV where he earned a psychology degree from Shepherd University. Jeff has two CDs out: “Alternating Current” (with Matthew Shipp on piano and William Parker on bass) and “For the Love of Sarah” which his wife Sarah pushed him to complete. Reviews have named “Alternating Current” one of the best recordings of the year. From January on for the rest of 2015 (at least), you can hear local bluegrass performed by Brunswick resident Eric Knowles (formerly of ClearSpring) and friends from around here at Beans in the Belfry on the Second and Fourth Thursday from 7 to 9pm. It makes for a relaxing evening with good harmonies, deft picking and fine fellowship. You can get supper there as well, such as homemade beef stew, chili with corn muffins, hot grilled paninis and more. 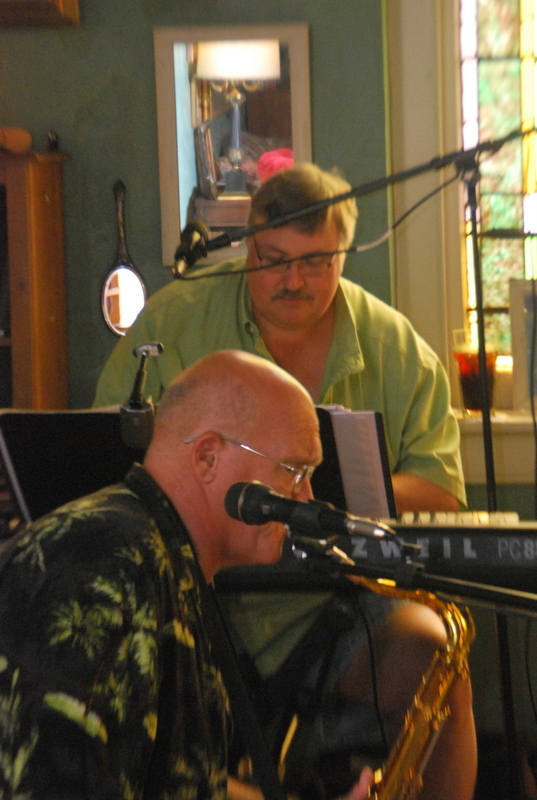 It was a fine afternoon at Beans in the Belfry. Ernie Bradley from Grassy Ridge, in the black hat on banjo, de facto led us; his brother, directly behind Claude Jones, Randy Leith, played terrific resonator guitar; to the left, Eric Knowles from Clearspring played banjo and guitar (that’s his son peering up from behind the couch); Roger Worthington from Hagerstown is on the bass; that’s Linda Adkins on fiddle; Mike Ward is in the white Tee with his back to us; Josh Ungar is next to him on mandolin and next to him is Jason Hannan also of Clearspring who played guitar – there were a couple more guitar players not seen in this photo, Jerry Swope out of Hagerstown, and a newer player who’s name escapes at the moment. Join the jams or plan to listen. Come hungry and thirsty because Beans in the Belfry serves terrific eats that you can pair them with a local beer or glass of red wine. Get yummy desserts too and the best espresso or latte in around! 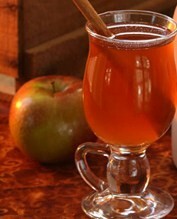 Pure Hot Spiced Apple Cider from Vermont being served here! Hot spiced apple cider – yumm! Will Gormly, owner of the Mountain Cider Company in Vermont wrote to us the other day. Will is counting 25 years since he started their cider mill, and we at Beans in the Belfry, are celebrating 10 years in business this year. So together, we can continue to serve our customers his 100% pure apple cider with natural mulling spices, no preservatives, no added sugar, no allergens, gluten free, and high in natural potassium. Get it with a cinnamon stick, a slice of lemon, or with whipped cream and caramel topping – however you like it best. Furthermore, Will said that this fall he will be installing a 48 panel solar array on the roof of the cider mill. This should be able to cover 100% of the electricity needed for making their Hot Spiced Apple Cider Concentrate. So the shocking news is, that artificial sweeteners might be triggering higher blood-sugar levels in some people and contributing to the problems they were designed to combat, such as diabetes and obesity, according to new findings published Wednesday in the journal Nature. 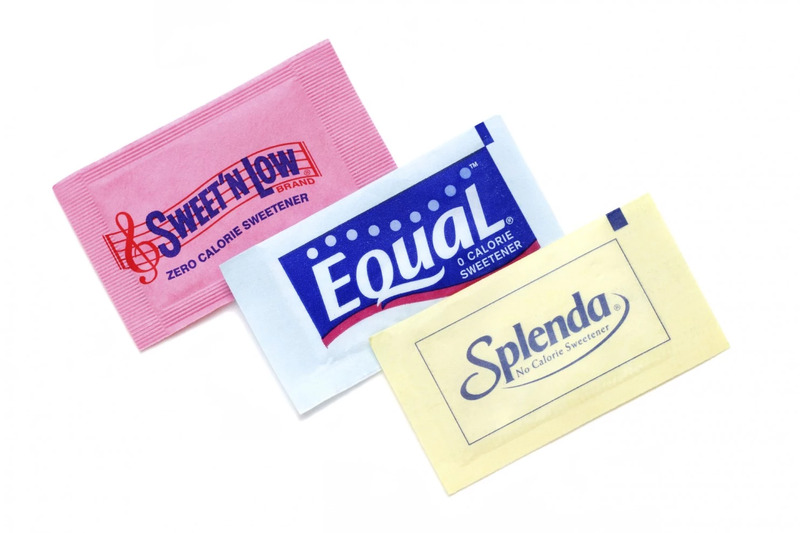 When you next reach for a packet of Equal or Splenda to sweeten your coffee or tea, maybe just reconsider the original white sugar, organic sugar or honey. We have those options available @BeansBelfry.